The ingredients for Peggy Jean's Pies: A pound of passion and a dash of rebellion. 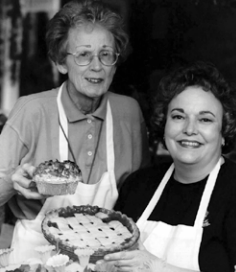 best friends Jeanne Plumley and Peggy Day made and sold handmade pies to the Columbia community. When Peg fell ill and passed away, the bakery became overwhelmed in her absence. The bakery shut down quickly after Peg’s passing- a tough blow to Jeanne and Columbia. 10 years passed, and Jeanne couldn’t find something that brought her as much joy as running Peggy Jean’s Pies. Jeanne's daughter, Rebecca, saw how much her mom missed the hustle and bustle of a warm pie kitchen. So, the mother-daughter duo both put their heads together about how to reopen Peggy Jean’s Pies. “When Peggy Jean’s closed I didn’t know if anyone would even remember the name. I had a real fear thinking 'oh Jeanne, it’s been 10 years, does anyone even remember Peggy Jean's?" Rebecca and Jeanne made the bold move to create a kickstarter to make their pie dreams happen. In under 30 days, the PJP team had raised $10,246 and was ready to reestablish Peggy Jean's as a cornerstone of the Columbia pie scene. Now Peggy Jean’s operates on a larger scale than ever before. Three generations of Miller women craft homemade pies for loyal fans and newly found pie enthusiasts alike. After a history of heartfelt women and a pie crust that’s taken years to perfect, Peggy Jean’s is proud to call Columbia home. See how Rebecca and Jeanne are doing today. Did this fairy tale pie story make you hungry? Us too! Meet the pies.